Gunpei Yokoi (横井軍平), Nintendo's legendary inventor and yearslong head of its R&D department, suffered a tragic death in a roadside accident on the 4th of October 1997, aged only 56. One month earlier, two products designed by his just established company Koto Laboratory were released. These would turn out to be Yokoi's final two games. Yokoi worked at Nintendo for over thirty years, and played a pivotal role in the company's evolution from a relatively small manufacturer of playing cards to a global player in the world of electronic entertainment. The list of inventions that bear his name is beyond impressive and includes the Ultra Hand, Ultra Machine, Love Tester, Kousenjuu SP light gun series, Ultra Scope, Light Telephone, Eleconga, Ten Billion, Game & Watch, Game Boy, Virtual Boy and more. As a result of Nintendo's prosperity, to which Yokoi himself had greatly contributed, the company's staff size had grown considerably and Yokoi's role had gradually become more managerial. He increasingly longed for the early days when most of his time was spent working hands-on on new ideas and inventions, and started dreaming about forming his own small ideas company that would allow him to do just that. In August of 1996 Yokoi retired from Nintendo, after completing the design of the GameBoy Pocket, and founded Koto Laboratory in September of the same year. 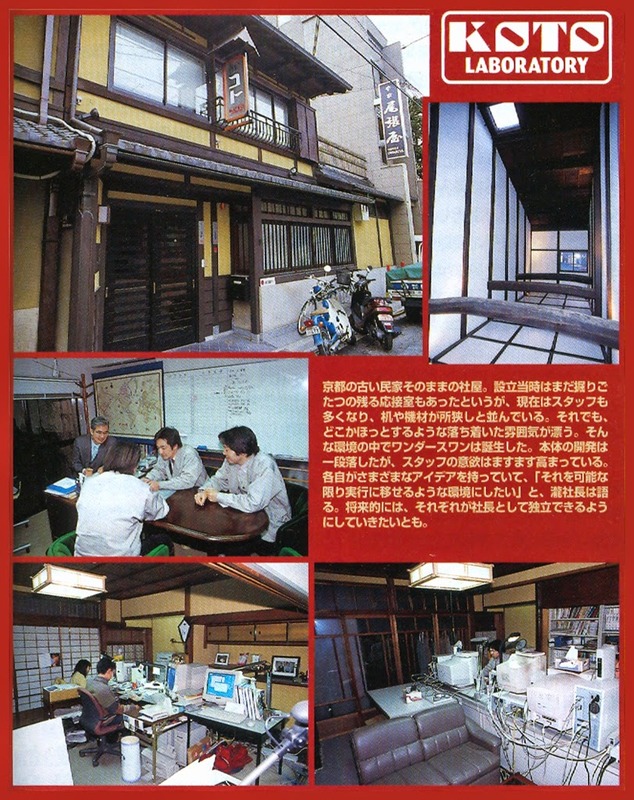 Like Nintendo, it was based in Yokoi's hometown Kyoto. 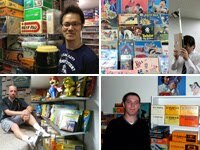 The small team that Yokoi assembled at Koto started working on a number of projects, including an assignment from toy giant Bandai. Bandai had asked Koto to develop a competitor to the Game Boy, one of Yokoi's most successful creations during his time at Nintendo. The Koto team also returned to another area were Yokoi had put a big stamp on in the past: LCD games. The heydays of the Game & Watch games were long over in 1996, but there still was a market for affordable, portable electronic games. Koto's first products, a couple of keychain LCD games, were released in Japan by Hiro Company in September of 1997, one year after Koto had started. The first of these keychain games was called Kunekunetchyo (くねっくねっちょ). The name means something like 'winding cord', which refers to the wriggling line character you control. Kunekunetchyo is a variation on the so-called snake video games, which became popular in the late 1970s and early 1980s. Examples of these are Surround on the Atari 2600 and the Rock-ola arcade game Nibbler. The snake game became globally popular when Nokia included a version of it, simply called Snake, on most of their mobile phones from 1997 onwards. 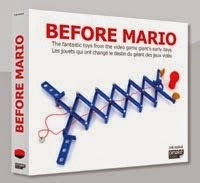 The game basics for all these snake games are the same: control a moving snake around the play area, without it touching either the walls or its own tail. You score extra points by eating food pellets, which also add to the length of the snake, making it increasingly more difficult to maneuver. In Kunekunetchyo, a nice little extra challenge is included. The food pellets do not remain stationary on the play area, but move horizontally or vertically from one side to the other. Not only does this make it harder to judge where to steer the snake to catch the pellets, but you have to eat the pellets before they cross the play area; when one of these pellets reaches the other side, it is also game over. The second of Koto's keychain games was called Professor Henoheno (プロフェッサー へのへの) or Henoheno for short. The game is labeled as an 'IQ challenge' (IQチャレンジ), and rightly so. Where Kunekunetchyo is mostly testing your reflexes, Henoheno requires more strategic thinking as well. The game's name can be translated roughly as "from there to there". In this game you have to make multiple segments connect in a continues line between the left and right side of the play area. You control professor Henoheno, who can move around the play area and swap the line segments above and below him. When you have placed a set of segments in a continuous line from left to right, you score points and the line disappears. In mode A, the segments steadily move up the play area, while new segments appear at the bottom. You have to make the segments disappear, by swapping these around so they form a continuous line, before they reach the top. When one or more of the segments reaches the top, it's game over. Mode B is a puzzle mode. In each round, a set of segments is placed on the play area. You again have to form continues lines and make the segments disappear. The challenge lies in the fact that you have to use all segments to form a structure that connects from left to right when the last piece is swapped in place. If you do it right, you move on to the next round. If you make only part of the segments disappear, the game ends. You may have noticed that Kunekunetchyo and Henoheno are labeled as numbers 4 and 5 in a series. These games were released by the company Hiro (ヒロ) in its LCD Keychain Series (LCD キーチェーン シリーズ), which consisted of seven games in total, each costing ¥1,000. Of the seven games in the LCD Keychain Series, only Kunekunetchyo and Henoheno are designed by Koto Laboratory. 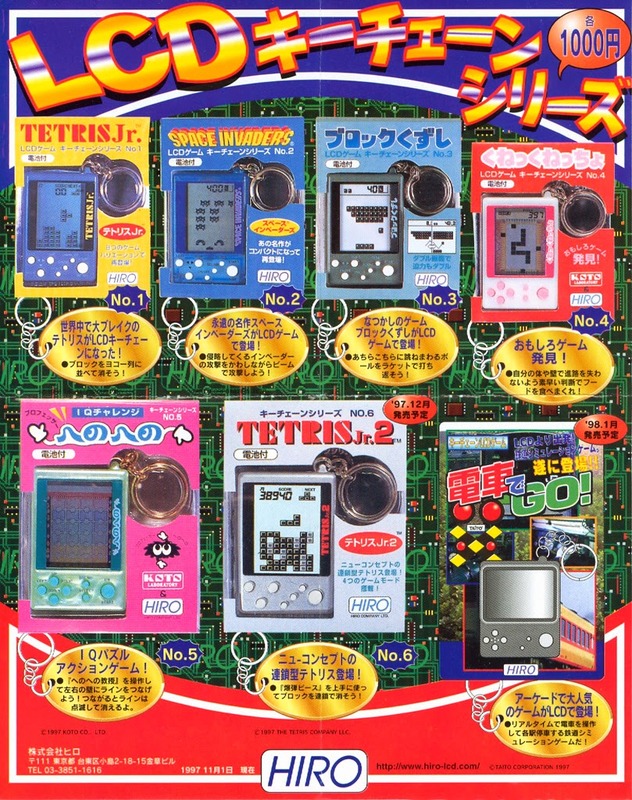 The other five games in the series are Tetris Jr and Tetris Jr 2 (licensed from The Tetris Company), Space Invaders and a pocket version of the train simulator Densha de Go (both licensed from Taito), and a breakout variant called Block Kuzushi. The latter is similar to Nintendo's 1979 Color TV Game Block Kuzushi, however this version was not licensed from Nintendo. By the way, if the concept of Henoheno sounds familiar, then you probably have played the game GunPey on the Bandai WonderSwan or on another game platform. After Yokoi's sudden death, the Koto team continued working on the projects that he started, including the assignment by Bandai. This assignment eventually resulted in the release of the Bandai WonderSwan in March 1999. 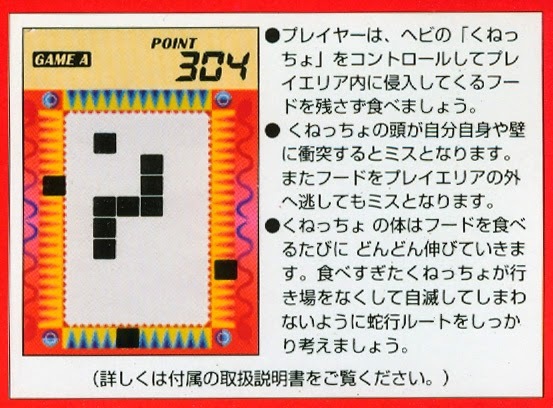 One of the launch titles was a game called GunPey (グンペイ). Both WonderSwan and GunPey were developed by Koto Laboratory. 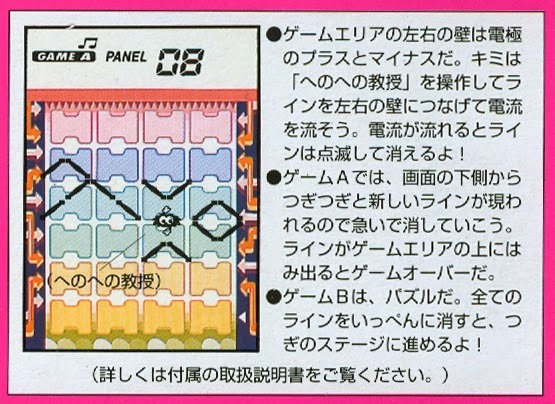 GunPey was an expanded version of Koto's keychain game Henoheno, and renamed in memory of its founder Gunpei Yokoi. 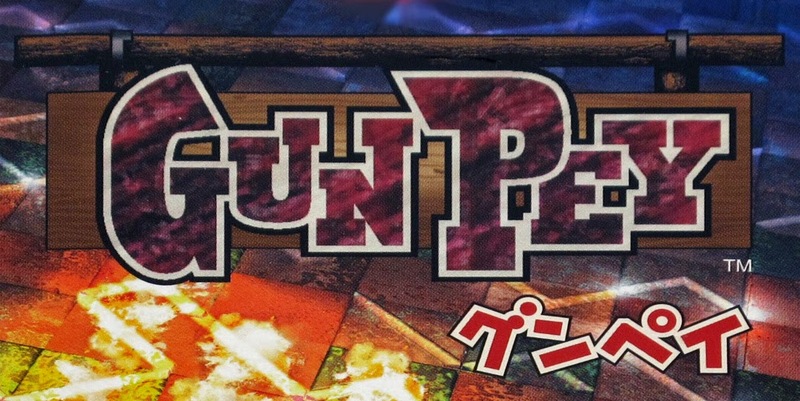 After its debut on the WonderSwan, GunPey has been ported to many different game systems, including the WonderSwan Color, Nintendo DS and Sony's PlayStation and PSP. The gameplay of GunPey is taken directly from Henoheno. The only real change is the size of the play area, which increased from 6 to 10 lines. Some additional game modes were also added. Kunekunetchyo and Henoheno did not reach the same commercial heights as most of Yokoi's inventions from his time at Nintendo. The WonderSwan did quite alright in Japan, selling a few million units, but was no match for the Game Boy Color. Still, this probably would not have mattered much to Yokoi, as his - much too brief - work at Koto allowed him to do what he liked most: creating new game experiences. According to Koto Laboratory's current President and CEO Kazuhiro Kubota, "Koto inherits its genes from Gunpei Yokoi's [...] philosophy to produce amusement goods. We think that enjoying ourselves at work is the best way to invent unique and amusing products." The company's motto still is "Enjoy your job to increase our customer's satisfaction". Gunpei Yokoi was a unique figure, who made a great contribution to the world through his toys and games. He loved creating new things that could amuse people. It is a real shame that his unfortunate early passing prevented him from continuing to enjoy his job for many more years. A previous post about Gunpei Yokoi can be found here. They are not that expensive. You can find Kunekunetchyo for between 500 and 1500 yen. Henoheno is more difficult to find, and may cost a little more. I guess not many people consider these very collectable (yet). I have buyed block kuzushi for 1€ in a street market. Thanks for the info. The label of the game is in japanese, now i know which is the name of the clone arkaoind game i have. A very interesting post. I will have to keep an eye out for Kenekunetchyo for my own collection, its an interesting piece of gaming history I wasn`t aware of. Thanks Sean. Kunekunetchyo pops up frequently on Yahoo Japan and it's a nice little game, so I do recommend that you look for one. Henoheno in puzzle mode is fun as well, but the endless mode can be a bit frustrating. But as collectors item it is great as well, as the very last game by Yokoi-san. Just one question though: why did the Wonderswan fail? Do you have any idea?